Modern Natural Baby Blog: Bamboozles in Stock! Bamboo is a miraculous and eco-friendly fibre. It is a renewable resource with a very short growth cycle and it is grown without fertilizers or pesticides. In short it is the perfect environmental choice for diapers! Bamboo fibre also absorbs 60% more than cotton and is naturally antibacterial, breathable and cool. This is why the Bamboozle is such a slim fitting and ultra absorbent diaper. 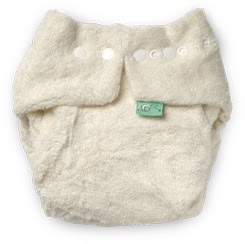 It requires less diaper changes, is comfortable for baby and not bulky under clothes! The Bamboozle is made by our pals at Tots Bots in Scotland. Their products are top rated in the UK, and the Bamboozle is their most popular diaper! We are very excited to be distributing their products here – their team is dynamic and ethically minded, and makes a good fit with our own. -Two sizes only will take you from premature (5 lbs) right through to potty training (35 lbs). It will fit well with the Super Whisper Wrap. For a truly deluxe offering – pair it up with a Polar Bummi! PLEASE NOTE: This diaper may take longer to dry than some other brands of fitted diapers,only because it is so much more absorbent.